"Our bodies are a series of joints—levers; thus we are made to lift one another, body and soul." THE SWAN LECTURES© is an immersive and experiential somaesthetic lab designed to return us to our bodies (and the bodies of others) as primary speaking subjects. We do this by cultivating our listening and responsive witness selves while building the deepest connection to empathic being. Learning a daily, anatomically-sound movement practice, engaging in mutual discourse, perceptual and contemplative writing, deep inner and outer listening and reflection time,-- this generative work has a living aesthetic ethos, one that recognizes and brings awareness to the need for cultivating bodily being as both site and bridge to corporeal compassion. Rooted to a philosophical view that recognizes confluences between aesthetic life, ethical behavior, and corporeal ways of knowing, THE SWAN LECTURES© actuates use of the whole of our beings -- bodily, cognitively, soulfully -- the integration of which underscores experiences of embodied wisdom. The ‘swan’ image has long captured the human imagination throughout history; it is as equally rich an image today. Listening deeply and responding to the call and significance of what the archetypal symbol of the swan offers us, facilitator L. Martina Young creates a body-mind-soul entrance into ways of thinking, feeling, and acting on the evocations therein, bringing us as individuals and as community toward meaningful, wholly (holy) responsible, and qualitative approaches to our lives and the lives of others in our shared world. language, thought, and activities that are diminishing, reductive, — contracting rather than elevating or expanding one’s desire to participate and loom large in the world. * Generativity in essence describes a self-contained system from which its user draws an independent ability to create, generate, or produce new content unique to that system without additional help or input from the system's original creators. In semiotics or epistemology, generativity refers to a form of communication that possesses compositionality and the ability to construct complex messages. About L. Martina Young, Ph.D.
L. Martina Young is a dance artist, writer, and scholar on a poetics of the body, somatic theory and practice, and the mythic imagination. She is the recipient of three National Endowment for the Arts Choreographer’s Fellowship and is one of the first Nevada-based artist to receive a National Endowment for the Arts Creative Project Grant for her collaboration with exiled Chilean poets Emma Sepulveda and Marjorie Agosin, adapting, together with the Nevada Shakespeare Company, their published book of letters, Amigas: Letters of Exile and Friendship. 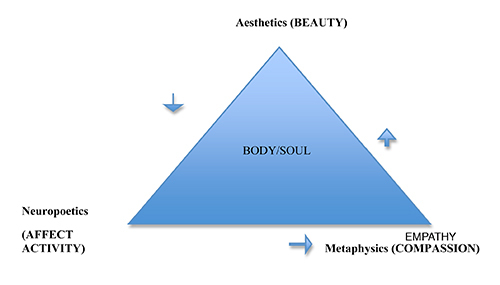 Martina’s doctoral work on a poetics of the body proposes new thought on corporeal compassion and the intersection of aesthetic experience and empathic being. Her life work, SWAN: a poetical inquiry in dance, text & memoir contextualizes these interests where symbolic image acts as a portal into the human imagination across time and culture as it continues to address its own evolution,--psychologically aesthetically, ethically, and poetically. The third performance installation of SWAN, “Heiros Gamos,” was invited to premiere at the 2014 International Exhibit of Contemporary Art at Gallery Le Logge, Assisi, Italy. While in Italy she joined L.A. composer and multi-instrumental improviser Vinny Golia and experimental and jazz saxophonist Gianni Mimmo for an evening concert of improvisation dance and music in Pavia, Italy. She will present her next installation of SWAN for the 2016 International Exhibit of Contemporary Art, following completion of her artist residency at Arte Studio Ginestrelle. Writing on author Toni Morrison’s poetics of the body in her Pulitzer Prize-winning novel, “Beloved Bodies: Gestures Toward Wholeness” was published in the anthology, Toni Morrison: Forty Years in the Clearing by Bucknell University Press (2011). She has also written on the work of choreographer Ralph Lemon, (itch journal, 2012), and on the mythic imagination (Coreopsis: Journal of Myth and Theater, 2013). As an essayist she writes for Reno’s arts and culture magazine, Reno Tahoe Tonight. Her column, The Swan Lectures, appears monthly. Since 2000, L. Martina Young has maintained a private practice as a movement and somatic therapist, combining a vast knowledge and lifelong engagement of the work of Clara and Joseph Pilates, Ideokinesis, and Functional Anatomy. Together with her work as a performing artist and studies in archetypal psychology, L. Martina Young is a workshop facilitator of rare and gifted skill, sensitive to creating the kind of learning environment that time and again has proven deeply insightful and illuminating for each and every workshop participant.